(Phys.org)—A pair of anthropologists has come up with a math model to help better understand individual conformity and how it relates to groups and societies as a whole. In their paper published in Royal Society Open Science, Paul Smaldino and Joshua Epstein with Johns Hopkins University describe the mathematical model they created to help show why it is that so often those who attempt to look or behave differently, wind up looking or behaving the same as others—the so-called hipster paradox. To begin, the research pair started with the assumption that virtually everyone engages in some degree of comparing themselves against others or what they believe is the norm. Most also wish to be different from the norm, though how much changes from person to person. That allowed for the beginnings of a model, people could be assigned points along a spectrum, other factors they added included the actual degree of divergence from the norm for each person, the ideal point for distance from the norm and an adjustment factor that would allow a person to move closer to their ideal point. 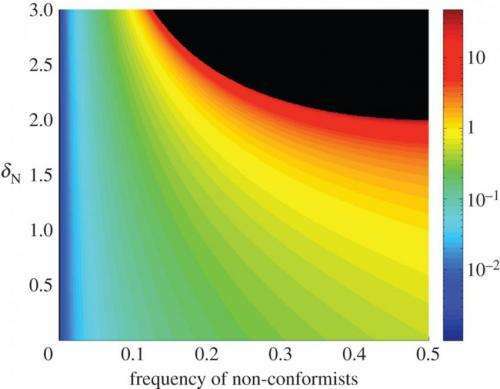 Using such information, the researchers drew up mathematical formulas that sought to describe the ways in which conformity, or non-conformity can work. If, for example, all of their factors indicated that everyone in a group was almost exactly alike, it wouldn't take much for one of those individuals to increase their non-conformity. On the other hand, if everyone were completely different, it would be difficult for any one individual to increase either their conformity or non-conformity. For more average cases, the researchers found that if everyone wants to be some degree of different, the group as a whole winds up moving closer to one another anyway, demonstrating more conformity and the hipster paradox—the slow movement of tattoo acceptance from outliers to the mainstream over the past couple of decades, is one good example. Interestingly, the model also allowed for running various what-if scenarios, such as what if the world were filled with just two kinds of people, those that were very seriously conformist, and those that were the opposite—or what if one group was much more dominant than the other. The results tended to align with what might be expected, clashes or dominating groups pushing non-conformists to conform. The researchers suggest their model might be useful for countries or groups looking to undermine certain conformist groups such as ISIS, who must constantly look for new members to survive.